In the wake of Infinity, the home of the Inhumans lies in ruins. Their king, Black Bolt, is nowhere to be found, and just before he disappeared, he threw the planet into chaos by setting off a bomb that encased anybody with traces of Inhuman DNA into cocoons that transform them into extraordinary creatures, a move that has affected millions of normal Earthlings. Matt Fraction and Olivier Coipel’s Inhumanity #1 (Marvel) sets the stage for Fraction’s upcoming Inhuman series, explaining the history of Marvel’s superpowered race and setting up an assortment of narrative threads to be explored in the future. With artists Leinil Yu and Dustin Weaver covering flashbacks to the Inhuman’s prehistoric roots and the events of Infinity, this first issue provides all the information readers need to dive into the new event, breaking down decades of continuity into three story threads that are easy to follow. Inhumanity #1 follows Inhuman detective Karnak as he investigates recent events, a crusade that brings him into direct contact with the Avengers. As Karnak breaks down Inhuman history for his superhero jailers, Fraction builds an epic narrative that pushes the Inhumans into Game Of Thrones territory, with the destruction of Attilan and disappearance of Black Bolt serving as the inciting incident for a story of warring tribes and royal intrigue. (The GOT resemblance does not go unnoticed by Fraction, who throws in a casual reference to dire wolves early in the issue.) Like George R. R. Martin’s fantasy tale, there’s a sense of foreboding running through this entire first issue, gradually intensifying until the tension snaps during a climax that echoes the fall of Bran Stark at the start of Martin’s epic narrative. 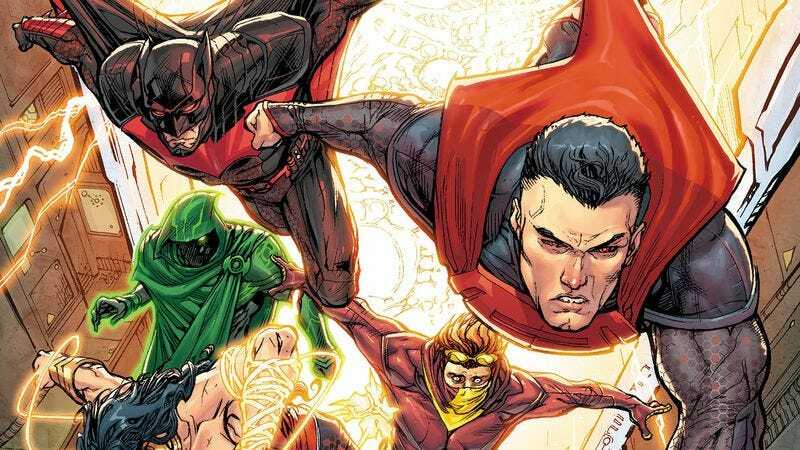 Valiant has been working very hard to build a shared universe for its superheroes, and the latest step is bringing characters from different titles together to create the publisher’s own version of the Justice League or Avengers. Named after an old Valiant crossover from 1992, Unity #1-2 (Valiant) brings Toyo Harada and Livewire together with Eternal Warrior and Ninjak to take down X-O Manowar, the time-displaced hero who has taken over Romania and named it the new home of the ancient Visigoth people. That sounds like a lot of nonsense, but it ultimately boils down to superpowered characters teaming up to stop another superpowered character, who has created an international incident by invading and occupying an entire country. Writer Matt Kindt provides the necessary exposition for newcomers, and his work on more complex titles like Mind MGMT and Red Handed makes him a great fit for Valiant’s characters and the moral gray area they inhabit. Harada is essentially the villain of Harbinger, but Unity gives him the opportunity to show off his heroic side, and casting X-O Manowar as the antagonist of the first arc pits the new team against a well-developed enemy with clearly defined motivations. The Visigoth leader is returning his people to their ancestral homeland after they were cast into space slavery, and now he fights to protect them from the political bodies he’s threatened in the process. It’s not a simple good-versus-evil plotline, giving Kindt the opportunity to explore deeper philosophical questions about power while providing the requisite superhero action. Keith Giffen and J.M. DeMatteis are the writing team responsible for one of the wittiest, most entertaining runs in Justice League history, so it’s no surprise that their influence has been kept far away from the current crop of intensely serious New 52 Justice League titles. They’ve done admirable work using their comedic voices to comment on a one-note title character in the pages of Larfleeze because they can make fun of the fact that they’re stuck writing Larfleeze, but they don’t have that kind of creative freedom on their new book Justice League 3000 #1 (DC). The tone of Giffen and DeMatteis’ script makes this book seem like one of those situations where creators are trying to work with the bum hand they’ve been dealt, and they ultimately take a blasé approach to a weak concept. The Justice League of the present is cloned to protect the far future, but the cloning process has left them significantly altered. These character changes are bluntly broken down in a stream of exposition from the scientist siblings nicknamed the Wonder Twins, and the clone aspect of the story reeks of ’90s storytelling, copying what’s popular instead of creating something new. “Am I the only one who thinks this is the stupidest idea ever?” Flash asks at one point in the issue, and the story doesn’t do much to negate his conclusion. These writers have shown that they have more imagination than this, but it’s limited by this book’s strict editorial restraints. In the year and a half since its debut, Monkeybrain has quickly established itself as one of the most diverse publishers in comics, a quality exemplified by two vastly different new releases. Prime-8s #1 (Monkeybrain) is a goofy superhero book about a team of primates gifted with extraordinary abilities, like a four-armed gorilla named Fourilla and a kung-fu fighting chimpanzee called Chimp Chan Z. Writers Michael Moreci and Steve Seeley realize the absurdity of their concept and bring a Saturday-morning cartoon silliness to the script, an approach that is accentuated by Kyle Latino’s Kirby-esque artwork. It’s the kind of wacky superhero comic that has fallen out of style at Marvel and DC, with bright, energetic visuals and a story that focuses on humor while still providing enough suspenseful superhero intrigue to keep readers coming back for more. D4VE #1 (Monkeybrain) shares a similarly humorous angle, though it tells a far more character-centric story than Prime-8s. A sci-fi workplace comedy set in a world where robots have eliminated the human race and fallen into the soul-crushing routines of their makers, D4VE looks at one android’s existential crisis as he dreams of the fantastic life he used to lead before getting stuck in a dead-end job at an evil corporation. Written by Ryan Ferrier and drawn by Valentin Ramon, it’s one of the most confident Monkeybrain debuts yet, building a fully developed future world that ingeniously blends technological fantasy with the mundane reality of domestic life. A man’s wife is dead, and he will stop at nothing to get revenge on the men that killed her. It’s not the most original concept, but Dead Body Road #1 (Image) is executed with a passion that brings white-knuckle momentum to the bloody proceedings. Writer Justin Jordan wastes no time diving into the thrills, quickly moving through the exposition so that he can depict one man’s unforgiving journey to punish those that shattered his life, a mission that is dynamically realized by artist Matteo Scalera. This book is focused on action over character—there’s not much development to protagonist Orson beyond being a brooding badass—and that’s totally fine when the action looks this good. Scalera is doing career-making work on his sci-fi series Black Science with Rick Remender, but Dead Body Road brings him down to Earth to showcase his skills staging gripping car chases and shootouts. There’s an amazing velocity to this first issue, both in Jordan’s bracing script and Scalera’s art, which sees an influx of speed lines whenever fighting breaks out. This is an ideal book for action-movie fans, full of attitude and invigorating set pieces that would translate extremely well to the big screen.